We have all had our fair share of disappointments, losses, broken dreams, and shattered hopes. None of us will get out of this life without our “stories to tell.” Whether it’s health problems, the loss of loved ones, broken relationships, personal losses, or (when fate is particularly cranky), a wicked combination of all of the above… none of us are disaster virgins. If you are reading these words and you’ve recently been dealt one of these blows to your life, take heart. Life may have knocked you to the ground, but you don’t have to stay there. You can start your climb back to the top starting today – IF that’s what you decide to do. Here’s a simple little plan – one that will help you climb out of the pit and put you firmly on safe ground in no time at all. First of all, decide if you’re going to get up or stay down. If the answer to #1 is get up, keep reading! If you decide to stay down, you can stop reading right now and go back to bed. Sadly, life will go on without you but you won’t go on without getting up. When you make the decision to “get up,” you’ll instantly feel a little better. Why? You’ve taken control of the situation. Whatever events led you to the pit may have been completely out of your hands. But now, you’re back in control of your own life and your own destiny. When you say, “I WILL GET UP!,” you’re already well on your way. You’ll need strength for the climb. If I had plans, this evening, to go outside and walk for 2 hours, I’d need strength to pull it off (and a couple of miracles, but that’s another story). I wouldn’t be able to just prance out the door and hit the happy trail as is. I’d need to make certain I was sufficiently hydrated, well rested, and my body would insist that I”d eaten right during the day. I’d need STRENGTH for those 2 hours of walking. The same holds true when we’re trying to get our feet beneath us after a major loss or disappointment. Determine where you get your STRENGTH from. Is it from prayer, loved ones, meditation, sleep, coffee, chocolate (!!! ), or all of the above? Yes, please. Determine where your own personal well of STRENGTH is, grab the biggest bucket you can find, and run (don’t walk) to your well. Fill ‘er up! Look in the right direction. Many, many, many, many people make the same mistake after turmoil: They keep looking back at it. I did this when I lost both of my parents. I kept thinking, “What if I’d MADE my mom go to the doctor sooner?… What if my dad had seen a different doctor…” – that sort of thing. I spent weeks with these thoughts and they made my recovery from the losses slower and even more painful. I created, in my mind, a scenario where I could have changed the outcomes – made the losses never happen at all. Basically, I put myself through hell and it most certainly never brought my mom or dad back. Quite possibly, a case could be made that I kept them from “resting in peace.” Why? Because I couldn’t rest with the loss. When something happens to us that knocks us down, we have to find a way to rest with the loss. If we don’t, we just keep reliving the nightmare over and over and over again. Unfortunately, each time we rehash or relive it, it’s as though it’s happening all over again. Our mind keeps replaying the emotions and heartache – and each time FEELS the loss all over again. This is why it’s imperative that we look in the right direction, which is of course FORWARD and not BACK. Find things that make you smile. That sounds about as simple as scratching an itch, doesn’t it? But, trust me, it’s something that will help you rediscover life again. When you’re trying to discover how to be happy and excited about life again, you literally have to make your face smile. Once it remembers how good it feels to be happy, it’ll want more of it! Whether this means going to a movie, watching favorite re-runs, reading a good book, or talking with people who always give you a lift – dive right in! Find reasons to smile and, before you know it, you’ll be smiling without reason. Be active. Not only is exercise great for your physical and mental health – it’s just as good for your emotional health. Exercise is a natural antidepressant. Studies prove it: Exercise reduces stress levels and prompts the body to release chemicals that make you feel good. Get moving and grooving and let those giddy little chemicals show you the way. Look ahead and keep looking ahead until you arrive safely. I know I’ve covered this one before, but as someone who has been on the front lines, I can tell you that it’s worth repeating. Don’t look back at the loss or the disappointment. I knew a woman over 15 years ago who wanted another child. She had 2 boys and desperately wanted a baby girl. She was a very religious and spiritual woman who prayed and longed for a daughter. She once told me and another woman that she’d spent so many years longing for what she didn’t have that she often wondered if she showed how truly appreciative she was for what she did have. Don’t ever present yourself with that question. Don’t look back at a loss. If you’ve lost a loved one, look back at their life with joy and happiness – not back at the loss with regrets or questions. If, like the lady in the example above, your loss is the loss of a dream – don’t focus on what you don’t have. Focus on what you do have. Remember: If you didn’t have these things, they’d be dreams! I know there are people reading these words right now who are trying to find their way out of a pit. I just want to tell you that you can make it! I also want to remind you that the climb is worthwhile. Don’t stay down and don’t give up. You have far too many beautiful things to see and far too many wonderful things to do to stay on your back in a pit. Put the loss and the pit in your rear view mirror then put some distance between you and both of them. The good stuff is up ahead, keep going until you get there. Great stuff, I would include near the beginning acknowledge how you feel about what is going on. recognise and accept that you are sad angry or upset. Once that is done the emotion does not have as great a hold and it is not being repressed, it is less likely to corrupt your life in the future. .-= Quinn´s last blog ..Want what you want =-. Count the garden by the flowers, never by the leaves that fall. 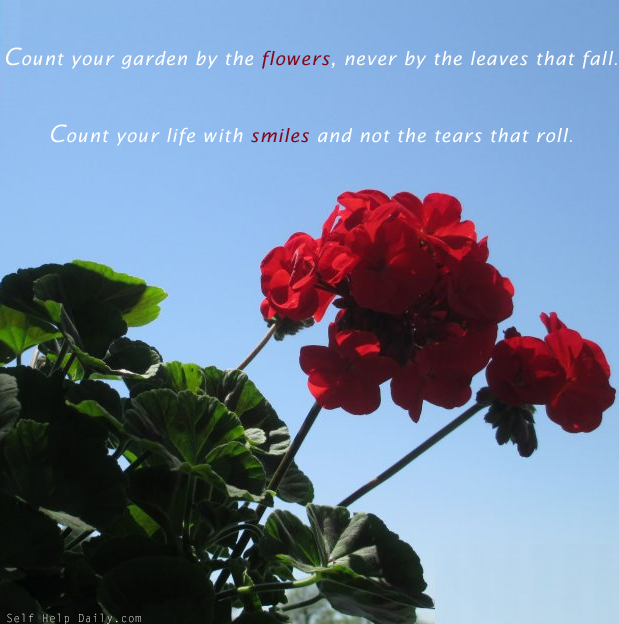 Count your life with smiles and not the tears that roll. – Author Unknown —this quote is beautiful. Thanks for this inspirational article. I know it’s been said a lot of times, to always move forward, to look ahead, and not behind. There’s another saying: Fake it until you make it. And it’s applicable here as well. If you don’t feel like moving on just yet, then fake it…fake a smile…eventually one day, you’ll wake up with a real smile on your face. I’ve been fortunate enough not to have a tragedy of a loss of loved one in my life. But I have lost loved ones in a different way. And I found this http://budurl.com/ncwa article helped me through it. I hope it will for you too. Megan, thanks for the sweet words. I’ve always loved (and readily used!) the Fake it until you make it philosophy. It really helps give you that head start that’s needed to keep going. Thanks so much for commenting! Quinn, I totally agree – great point! You are right about this. I’ve found it extremely helpful to always look on the positive side of things. At this point, it’s become natural to me to think positively even in the face of adversity. I also think it’s important not to blame yourself, because this accomplishes nothing. You can acknowledge that you did something wrong and learn from it, but putting yourself down will only make things worse. .-= Street Saint´s last blog ..Subliminal Learning =-. Beautifully written. I have MUCH experience with this process of getting back up. I they gave degrees in it, mine would be a Ph.D. And I’ve found that the most important step in all those you listed is find things that make you smile. It’s a matter of finding a different attraction point to bring better things into our lives. Even if we turn toward what we want, our awareness of the recent loss or disappointment can create a vibrational field that pulls more loss to us. Again, I have MUCH experience with this. It’s essential to turn our attention to something wonderful, something worth appreciating, something that makes us laugh. We must become the feeling we want to feel in order to attract the new experiences that will provide that feeling. Yeah–it sounds warped, but that’s how it works, and it can be done. .-= Ande´s last blog ..Why Hasn’t It Worked Yet? =-. Brave and strong words. Thank you. I might add that once you get up, you might fall back down. But you just have to keep getting up again. Its ok if you flounder between bed and waking but its important to keep trying. cat, You’re exactly right – most of it lies in simply getting up each time you’re knocked down. And getting up as soon as humanly possible! The longer one stays down, the more easy it is for them to just remain there. This article mentions a key point in maintaining happiness: don’t look back. I feel that this is key because you can’t change the past and you can’t have total control over your future. Very few people understand the cause of happiness. Many of us focus on friends, cars, and money as the true reason for happiness and devote all of our time and energy acquiring these things. The real source of peace of mind is in inner peace. Remember that if we have a peaceful mind, we will be happy. Having all the money in the world would not make us completely peaceful if we decide to let in all the negative influences and disturbances in our circle. Improve your personal life by creating a healthy surrounding for yourself and family. You can take steps to gain peace of mind. The first step is meditating at least once everyday. Allow your mind to focus on nothing. Once you are in the mood, allow your thoughts to graze the pastures. In addition, there is nothing wrong with taking time out to dream about a life that you would like to live. it is very beautiful and nice site.This is a great article to remind all bloggers .this is a very great and nice article. What is happiness? Asking someone to define happiness is like asking him/her to define success. Happiness can mean a lot of different things, and the definition may vary from one person to another. To one person, happiness may mean having lots of possessions. To another person, happiness may mean being very successful in his or her chosen career. To still another person, happiness may simply mean having a healthy and happy family. Ask yourself: What is happiness for you?